Pizza Hut is about to turn 60 years old, which makes it sort of like a grandfather figure to the pizza-consuming nation. That said, you may want to show some respect for your elders when we tell you its birthday is coming up. As the company first opened on May 31, 1958, that anniversary is fast approaching. So, how will Pizza Hut be celebrating this occasion? By putting a stupid amount of cheese on its pizza, obviously. 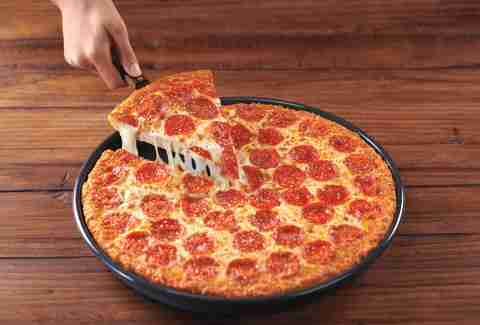 To be exact, the Hut is launching a special new pizza called the Double Cheesy Crust Pan Pizza. It's a combination of two of its greatest hits: the Original Pan pizza and the iconic Stuffed Crust pizza. A layer of toasted parmesan is baked into the crust of the Original Pan pizza, which is then topped with even more parmesan and oregano. So, again, there's gonna be cheese. 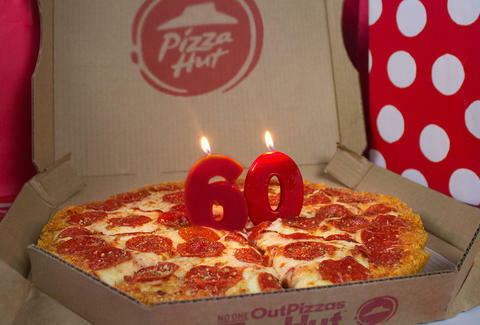 This special birthday pizza will only be around for a limited time, though. If you really want to honor this carb-heavy institution, you'll try to eat 60 slices. You won't succeed, but it's the gesture that counts.